SMPBS (Size Modified Poisson-Boltzmann Solvers) is a library of size modified Poisson-Boltzmann equation (SMPBE) solvers that incorporates finite element, finite difference, solution decomposition, domain decomposition, and multigrid techniques. It has been published in the Journal of Computational Chemistry . 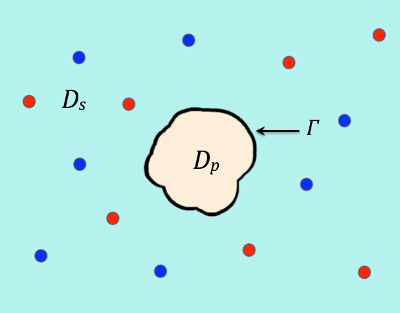 A sister site, the SDPBS web server, uses the classic Poisson-Boltzmann model. where u is an electrostatic potential function in units kBT/ec, Λ is a parameter for characterizing the size effects of ions and water molecules on electrostatics, ∂Ω denotes the boundary of a sufficiently large bounded domain Ω for calculation, Dp, Ds, and Γ denote a solute region hosting the biomolecule, a solvent region, and an interface between the solute and solvent regions, respectively, which satisfy that Ω = Dp ∪ Ds ∪ Γ as illustrated in Figure 1. The other parameters are given in Tables 1,2, and 3. Figure 1. An illustration of a protein region Dp surrounded by solvent region Ds. Γ denotes the interface and the two species of ions are colored in red and blue. Table 1. Physical constants of SMPBE. Table 2. SMPBE model parameters. Table 3. Other SMPBE notation. The SMPBE model can be solved numerically in the SMPBS web server by a finite element solver  or a finite element and finite difference hybrid solver . Both solvers were developed in Prof. Dexuan Xie's research group by using advanced techniques of solution decomposition, domain decomposition, and multigrid. Their computer programs were written in C++, C, Fortran, and Python based on the state-of-the-art finite element library DOLFIN from the FEniCS Project . Their finite element meshes are generated by a molecular surface-fitted tetrahedral mesh generator called GAMer-II, which is an extension of a molecular surface and volumetric mesh generation program package reported in . GAMer-II can generate tetrahedral meshes for a rectangular or spherical computational domain and three molecular interfaces - the Gaussian surface, the solvent-excluded surface (SES), and the solvent-accessible surface (SAS) [5, 3]. It can adaptively generate the seven overlapped boxes of the computational domain and a mesh of the central box that mixes an uniform Cartesian mesh with an unstructured finite element mesh for the finite element and finite difference hybrid solver . First, select either solvation energy or binding energy calculation. Before submitting a job, prepare PQR file(s) of a biomolecule. 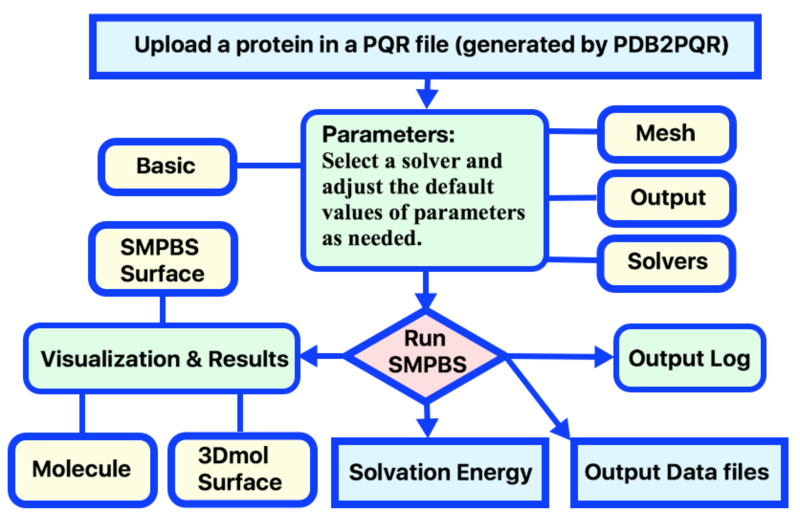 This can be done by first downloading a PDB file of the biomolecule from the RCSB Protein Data Bank (PDB), and then converting it to a PQR file by using the web server PDB2PQR. Next, adjust calculation parameters as desired, and submit the job. A typical work flow for a job submission in calculating solvation energy is illustrated in Figure 2. Figure 2. Diagram of of SMPBS Solvation Energy user workflow. The SMPBS web server is developed by Professor Dexuan Xie's research group in the Department of Mathematical Sciences and Yang Xie of the Department of Computer Science at University of Wisconsin-Milwaukee (UWM). It is hosted and maintained by the Information Technology Office in the College of Letters and Science at UWM. Development was partially supported by the National Science Foundation, USA, through grant DMS-1226259. Please contact Dexuan Xie via email (dxie@uwm.edu) with any questions regarding the server. Yang Xie, J. Ying, and D. Xie. SMPBS: Web server for computing biomolecular electrostatics using finite element solvers of size modified Poisson-Boltzmann equation, Journal of Computational Chemistry, 38 (8) (2017) 541-552. 12/05/17 - Add new reference 7. A. Logg, K.-A. Mardal, and G. N. Wells, eds., Automated Solution of Differential Equations by the Finite Element Method, vol. 84 of Lecture Notes in Computational Science and Engineering, Springer Verlag, 2012. D. Xu and Y. Zhang. Generating triangulated macromolecular surfaces by Euclidean distance transform. PloS ONE, 4 (12) (2009) e8140s. Z. Yu, M.J. Holst, Y. Cheng, and J.A. McCammon. Feature-preserving adaptive mesh generation for molecular shape modeling and simulation. Journal of Molecular Graphics and Modelling, 26 (8) (2008) 1370-1380. Nicholas Rego and David Koes. 3Dmol.js: molecular visualization with WebGL. Bioinformatics 31 (8) (2015) 1322-1324 doi:10.1093/bioinformatics/btu829.